← New England Flower Show – Just delightful! First street-side tree garden sighted! If you find yourself walking along Newbury Street in the next few days and weeks, stop in front of the Marc Jacobs store and look down. 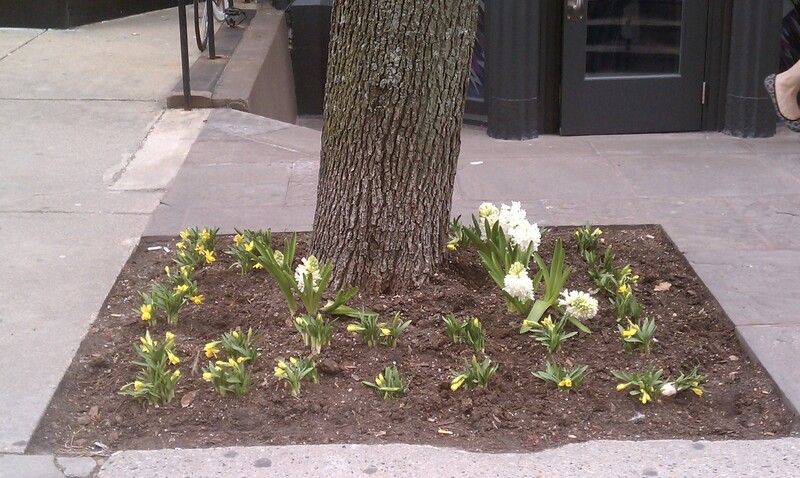 An optimistic gardener has planted perky, yellow daffodils and white hyacinths around a sturdy tree. What a bright and fragile touch of spring! No fence, no border protects these flowers from the dogs and humans passing by. I stood and watched for a minute or so. It was great to see people notice the flowers and smile.. and move a bit away to give the little patch some room to be. Spring is nearly here. Just a few hours away…. Ahhhh.